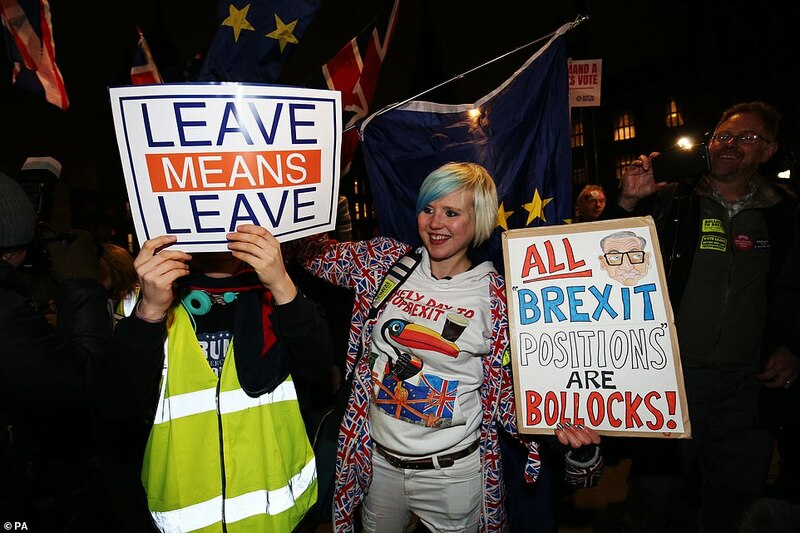 Both Remain and Leave supporters rejoiced outside Parliament last night after MPs rejected Theresa May’s Brexit deal by a majority of 230 – the biggest government defeat in history. 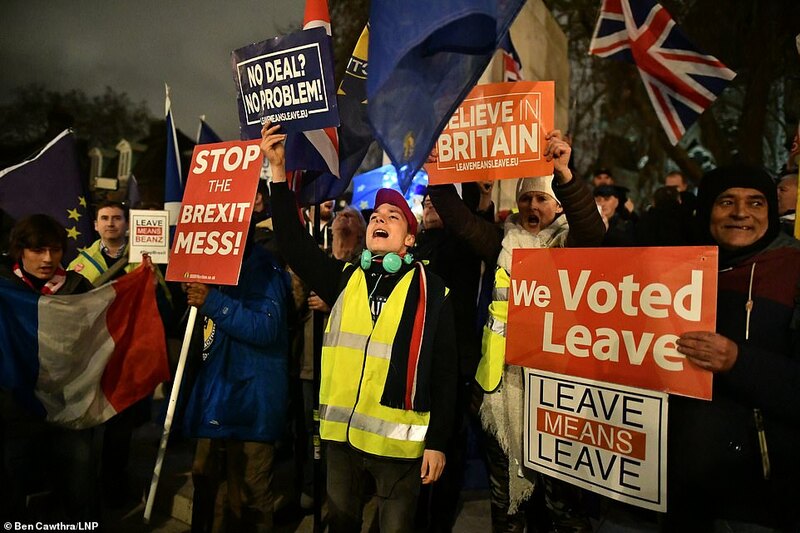 Protestors from both sides of the debate had been waiting on College Green and Parliament Square for the outcome of the vote since yesterday morning – although many had dispersed by the time the result was announced. 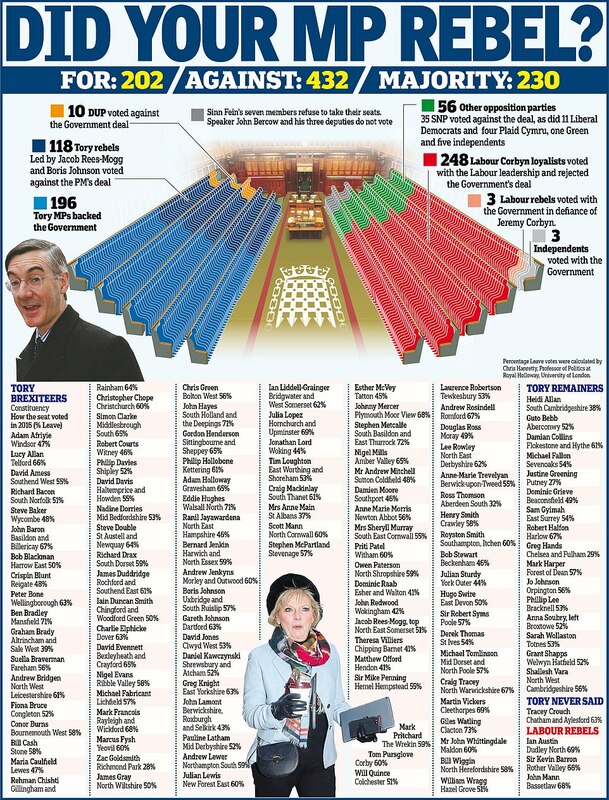 The majority of those present wanted to see Mrs May’s deal voted down. 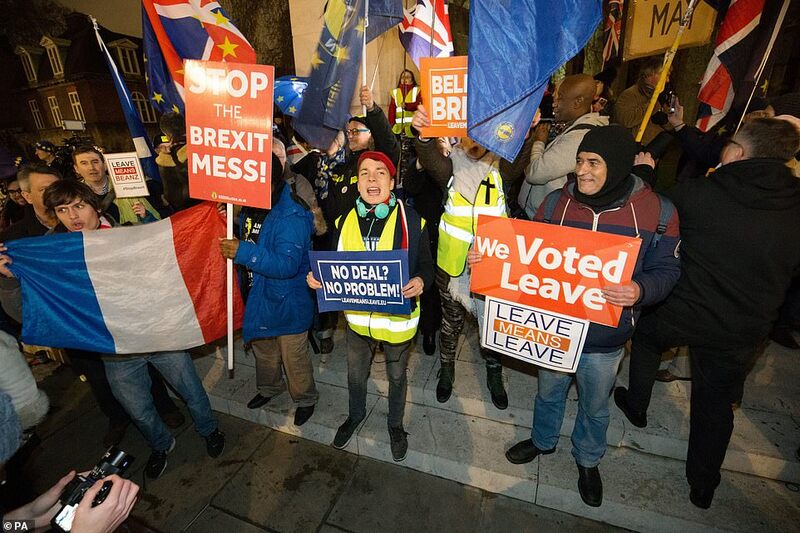 A group of ‘gilet jaune’ protesters chanted ‘Bye bye EU, bye bye’ to the tune of Auld Lang Syne, as pro EU demonstrators sang ‘You can stick your Brexit up your a***’. The exchange was peaceful although police and security staff were present. 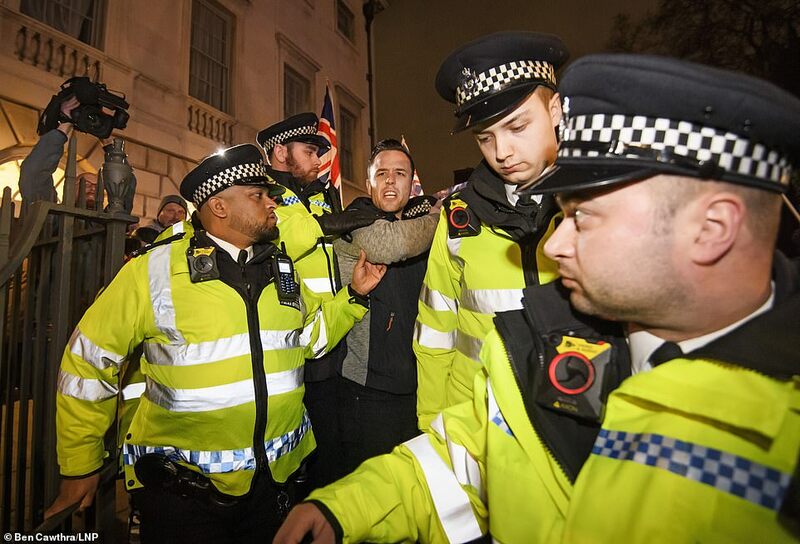 However, there were dramatic scenes earlier as a far right protester and bodyguard of Tommy Robinson was arrested. 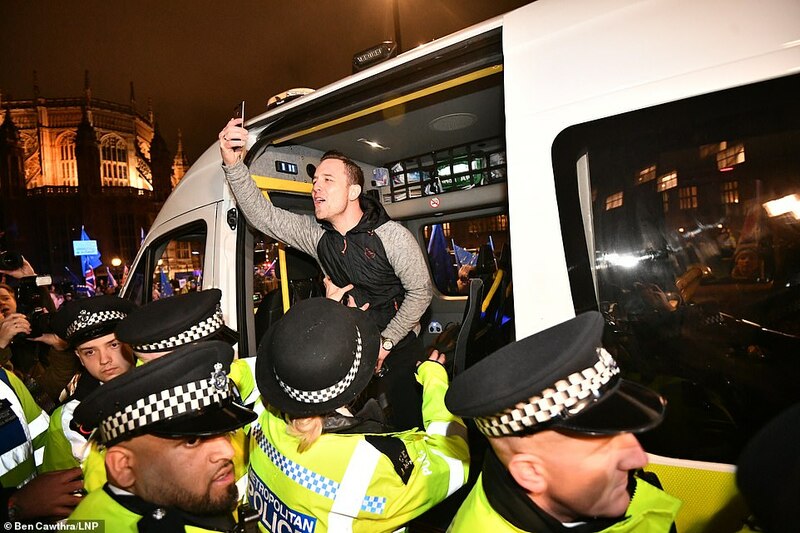 Daniel Thomas was among protesters at a ‘Yellow Vest’ demonstration this weekend attended by James Goddard, who was arrested over ‘Nazi’ slurs aimed at Tory MP Anna Soubry last week. 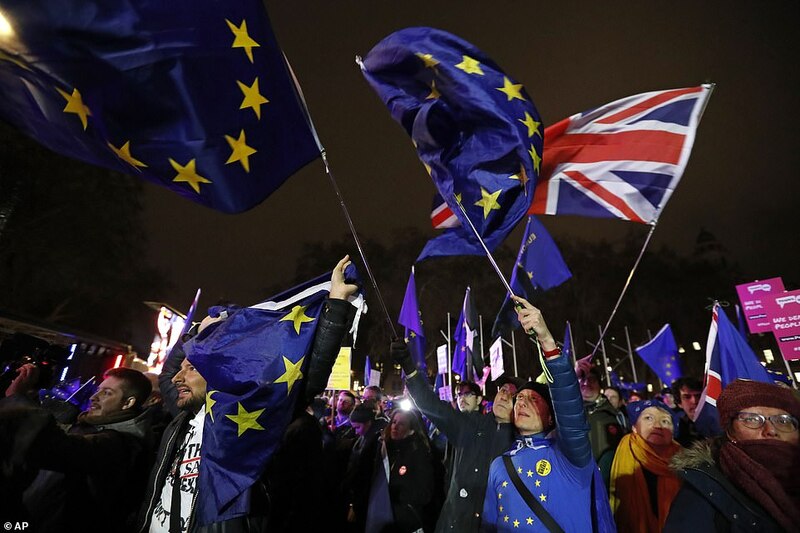 The pound swung sharply last night as business leaders warned that Theresa May’s Brexit defeat has sparked a national emergency that could cripple the economy. Sterling fell to under $1.27 in the moments after the vote, before rallying to $1.286. Against the euro, sterling fell towards €1.11 before bouncing back towards €1.13. 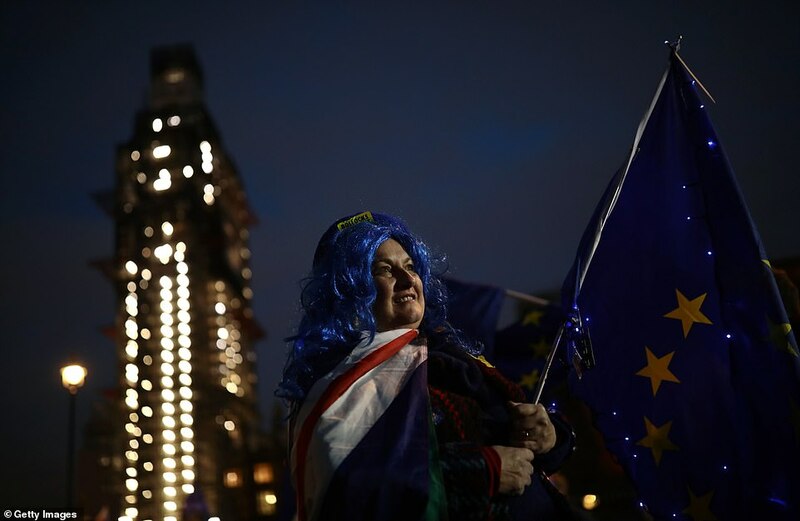 The bounceback came as traders bet Brexit could now be delayed and weakened – or even overturned. 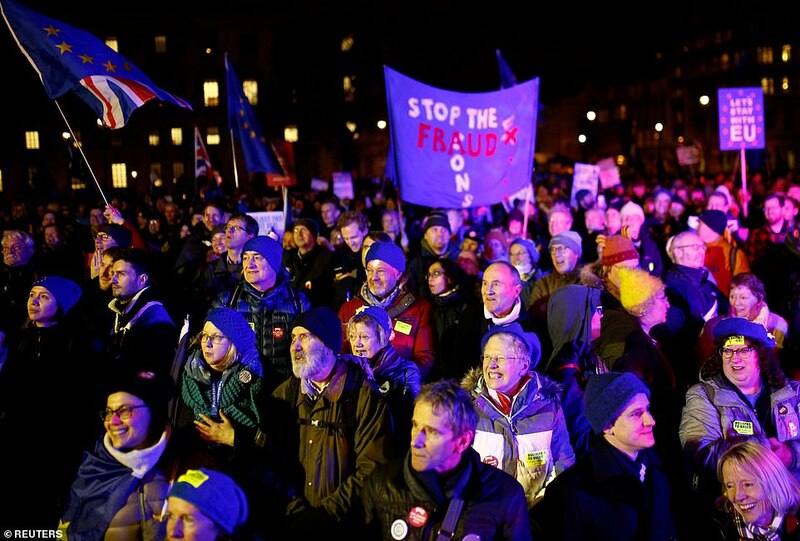 Meanwhile, business leaders voiced concerns over the continuing uncertainty. 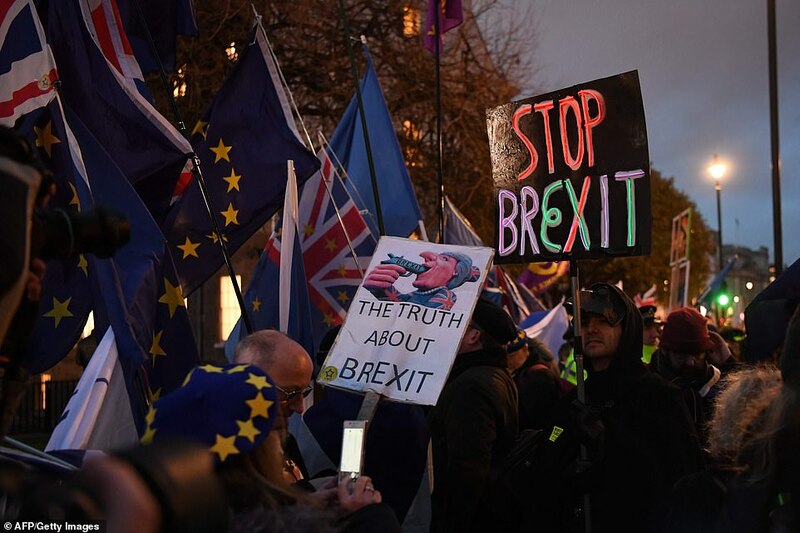 Most senior City figures backed Mrs May’s deal because it ruled out the risk of no deal, which they fear could create chaos at Britain’s borders and risk a recession. 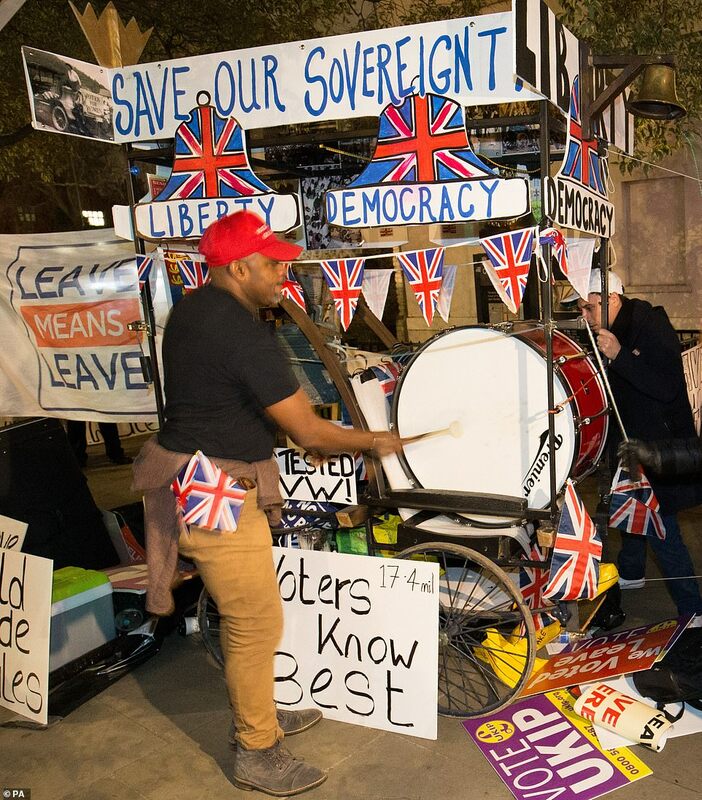 One group of Remain protesters kept up a steady racket with a bell and a bass drum they dubbed The Liberty Bell with the words Save Our Sovereignty above it. 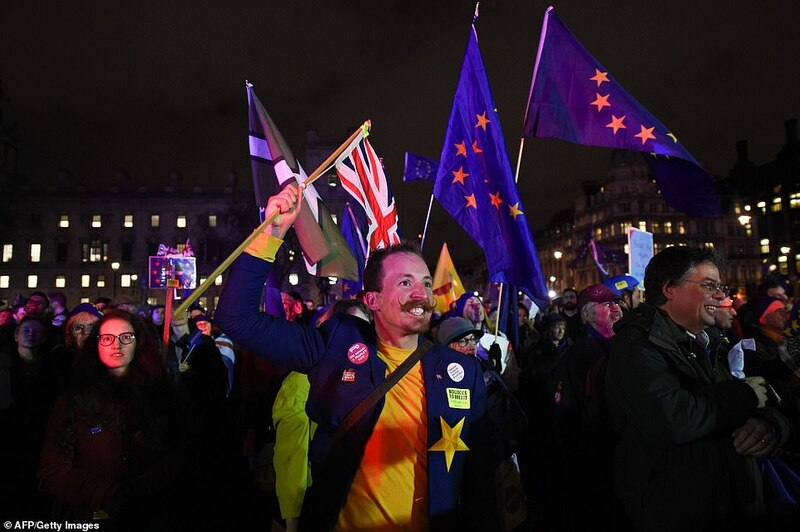 Remainer John Wilkins, 64, from Crediton in Devon, also wanted to see the deal blocked. ‘The Government hasn’t managed to find a solution to the Irish border and no one is happy with the agreement,’ he said. 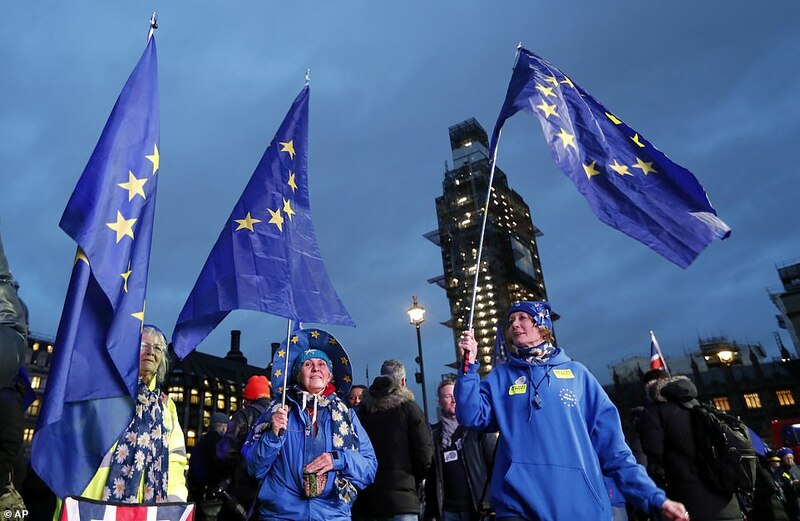 In nearby Parliament Square a platform and two screens were set up by those campaigning for a people’s vote. 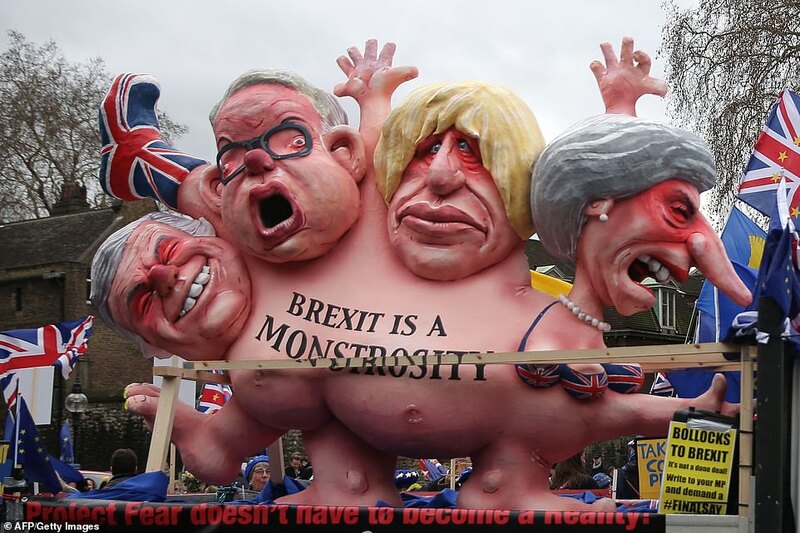 A float with a sculpture of Theresa May, Boris Johnson, Michael Gove and David Davis with the words ‘Brexit is a monstrosity’ circled the area. 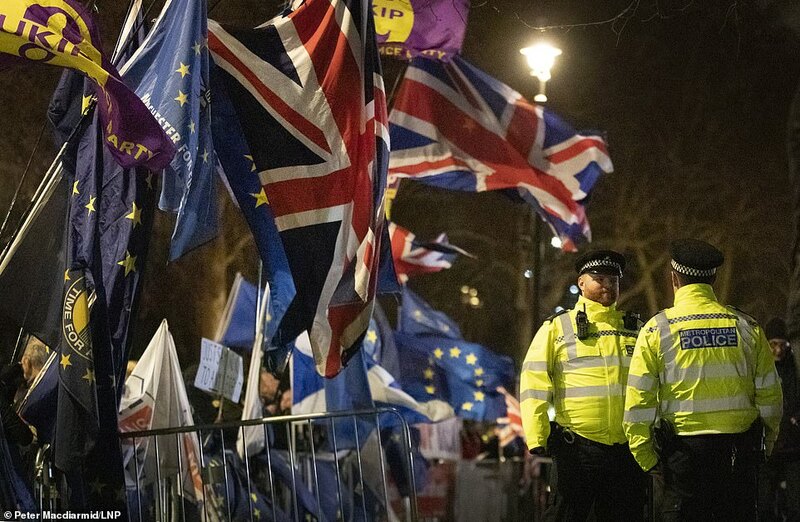 The demonstrations ahead of the vote were calm, although a small number of ‘gilets jaunes’ protesters verbally abused police, calling them ‘EU Police’ and ‘EU fascists’. 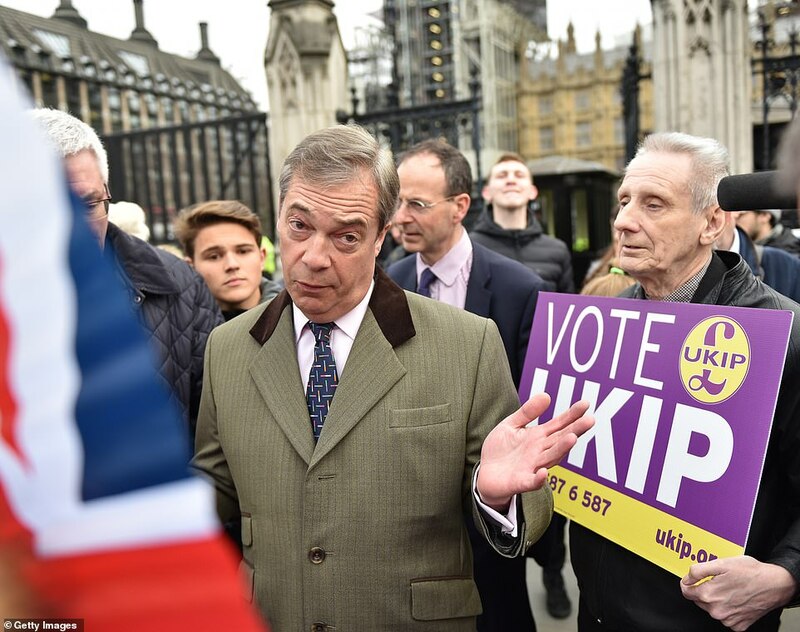 Earlier yesterday, former UKIP leader Nigel Farage posed with pro-Brexit campaigners on Parliament Square as the number of protestors from both sides continued to swell. 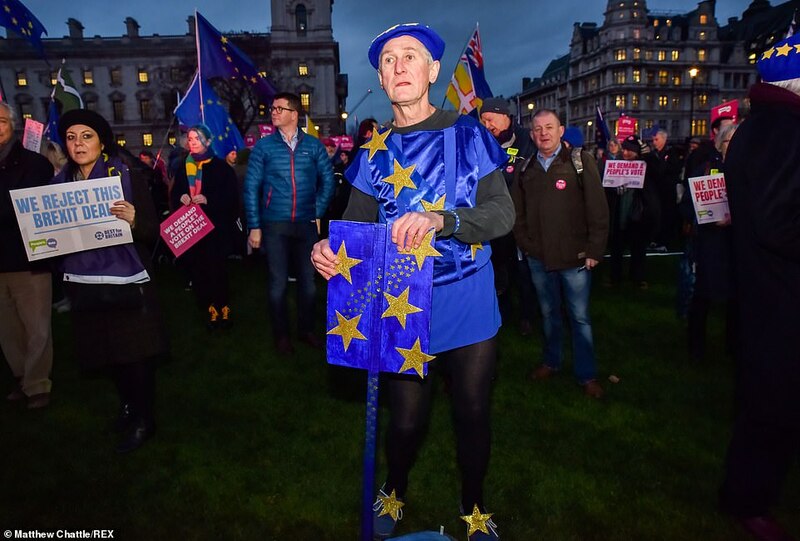 He claimed Mrs May had never really wanted to leave the EU. ‘This should be a day of celebration for Brexiteers but unfortunately the Prime Minister never wanted us to become an independent country, her deal costs us a fortune, ties us into EU rules indefinitely and is a total shocker,’ he told the Daily Star Online prior to the outcome of the vote. 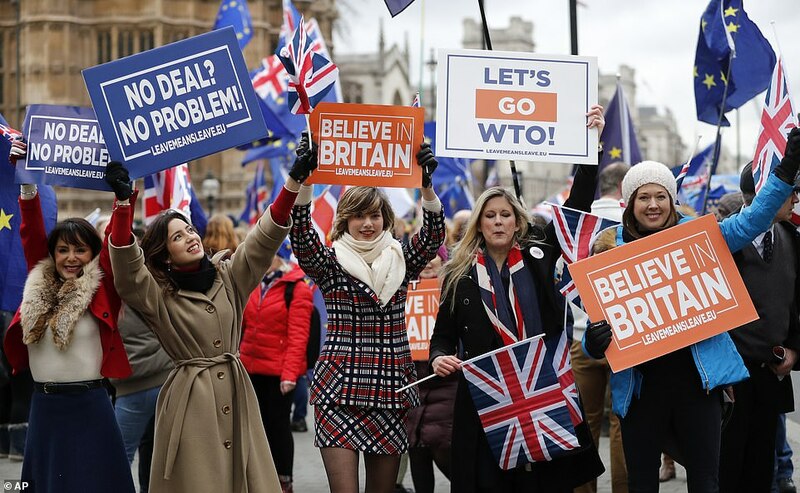 Crowds converged on the square and street opposite the Palace of Westminster – the formal name for the Houses of Parliament and grounds – from around 10am, under the gaze of TV cameras beaming the images around the world. 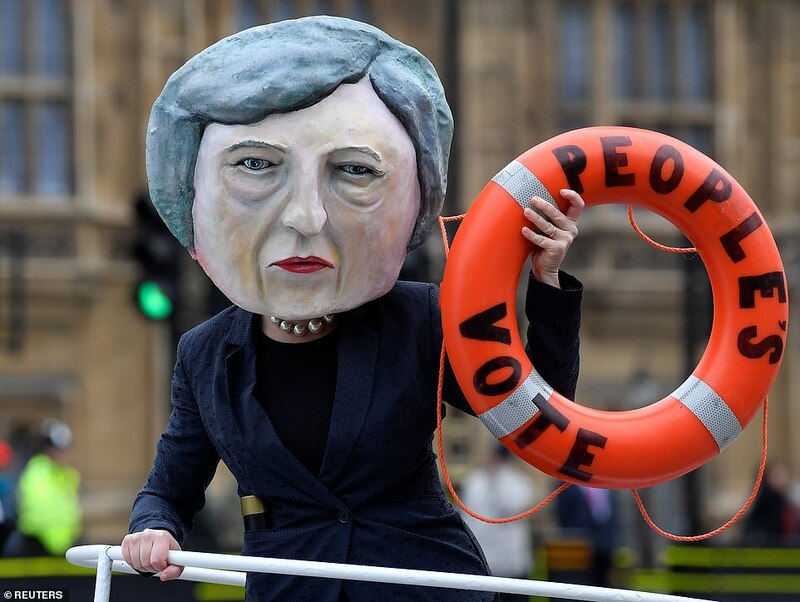 In one of the more eye-catching displays, pro-EU protestors reimagined the Titanic disaster, erecting a cardboard ship, iceberg and caricature of Prime Minister Theresa May on the bow beside a life-ring. 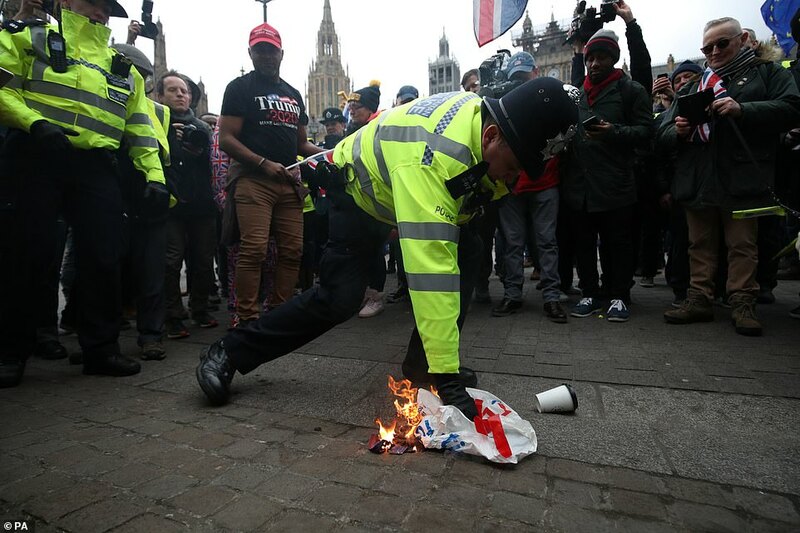 ‘This is a symbol, people are showing what could happen,’ observed Joseph Iliasz, a Polish tourist visiting London who stopped to view the spectacle. At first, it looks funny, but if you think more, it is not funny, it is rather sad,’ he said. 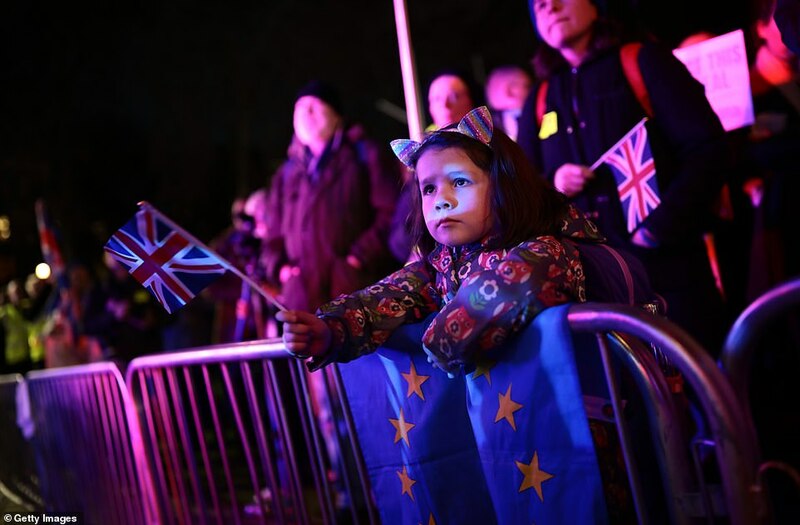 Mr Iliasz admitted he is worried that his daughter will not be able to study in the British capital after Brexit. 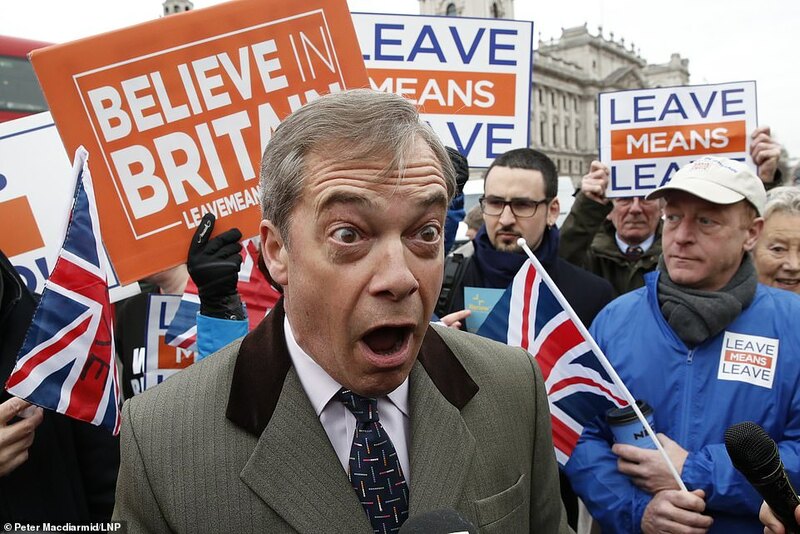 ‘We want to keep England in Europe,’ he added. Others had showed up simply to witness the spectacle. 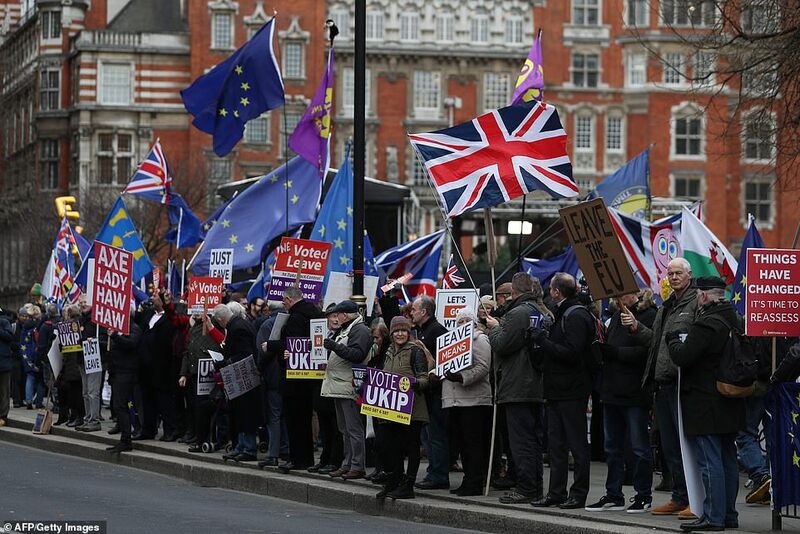 Tony Brack, who was in London for business, used his mobile phone to film the growing numbers of demonstrators mid-afternoon waving signs and placards like ‘Don’t Let May Betray the UK’ and ‘Stop the Brexit Mess’. 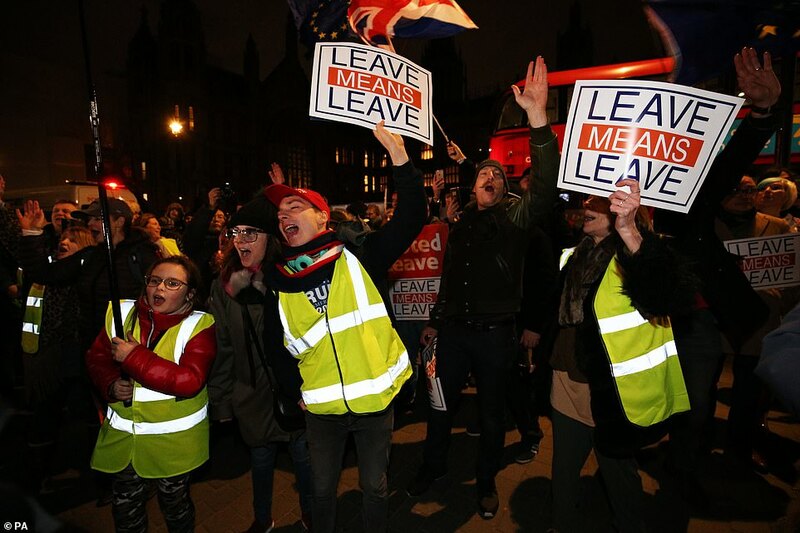 Earlier in the day, demonstrators had lined the walkways around nearby makeshift broadcasting studios, with each side staking out their camp and no mingling on show. 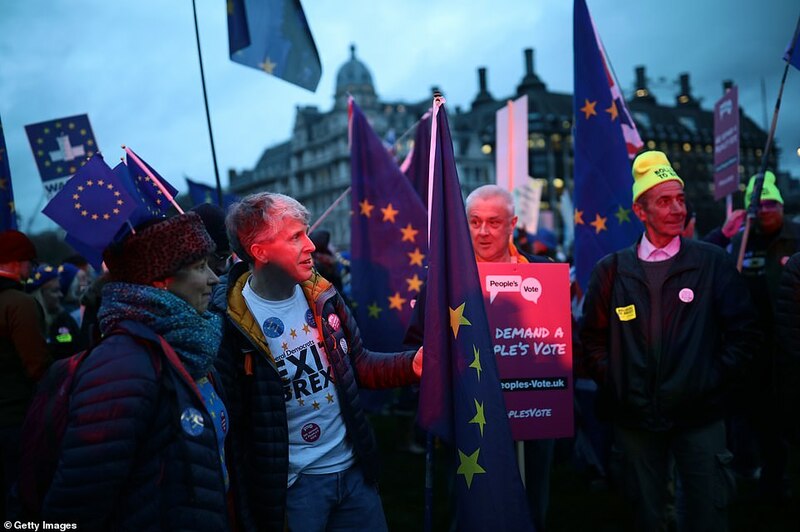 ‘I would have talked to them, but because they are abusive, no,’ said 65-year-old Sally Smith, pointing to the pro-EU faction. 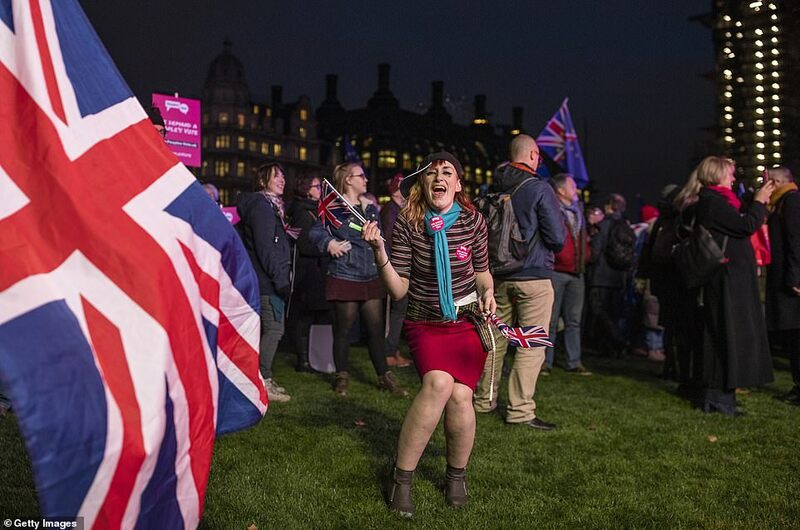 The no-deal Brexit supporter, originally from Shropshire near Wales, had taken the day off work to come and make her point – by frantically ringing a bell. 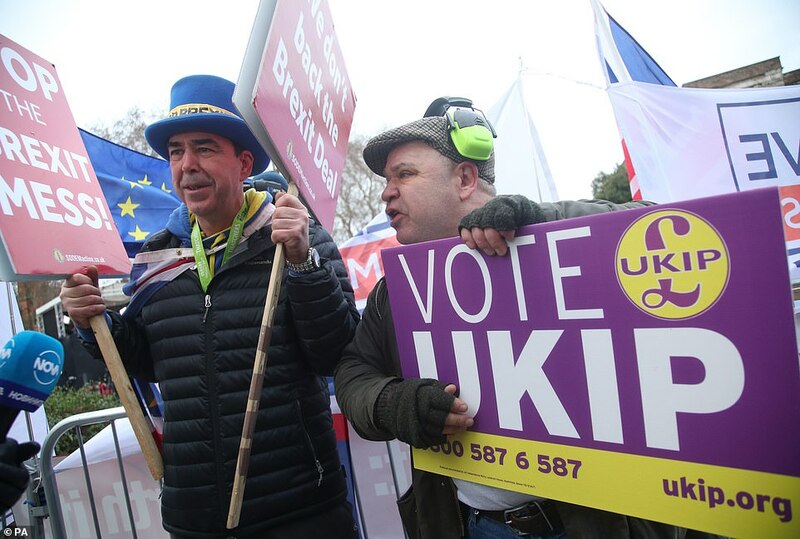 In the opposite camp, Louise Hummerstone, a 66-year-old potter and craftswoman wearing an EU beret, admitted that she had ‘lost friends’ who voted Leave in the 2016 referendum. 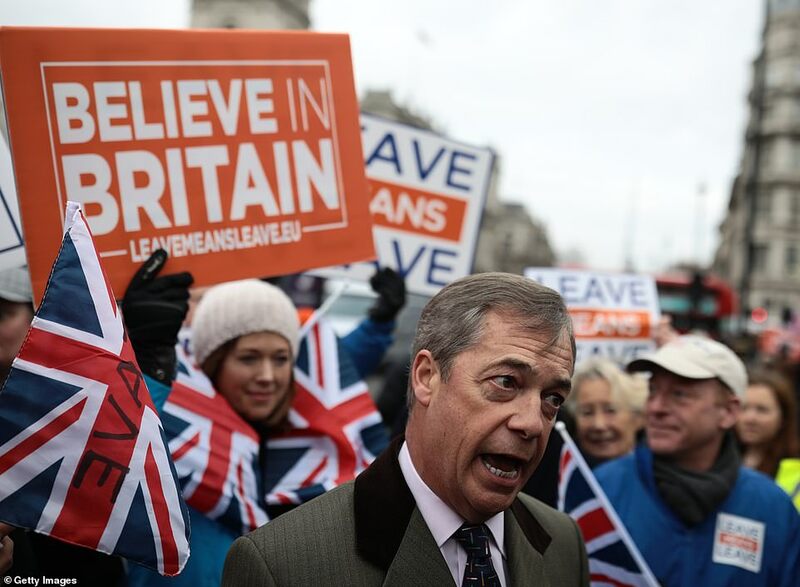 ‘I can understand naive voters, I completely understand people who believed the lies, but I cannot tolerate those who voted for racist reasons,’ she said. 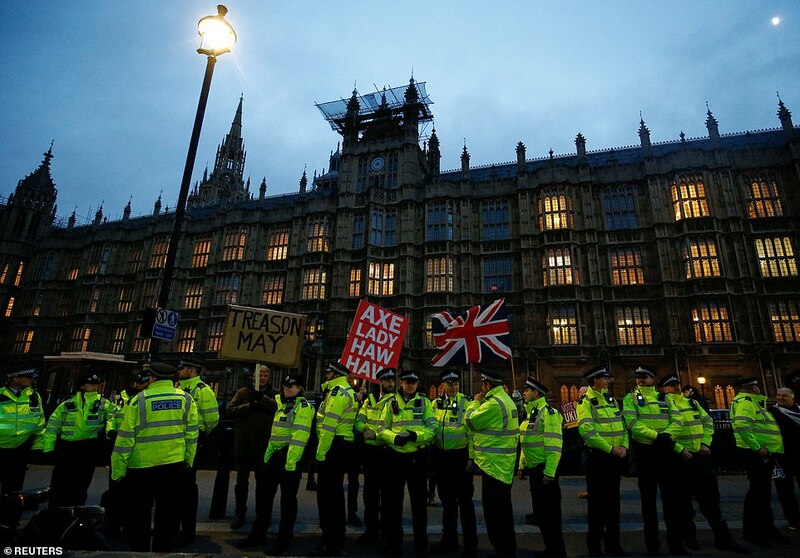 Despite the entrenched opposition, the atmosphere remained civil as large numbers of police looked on. 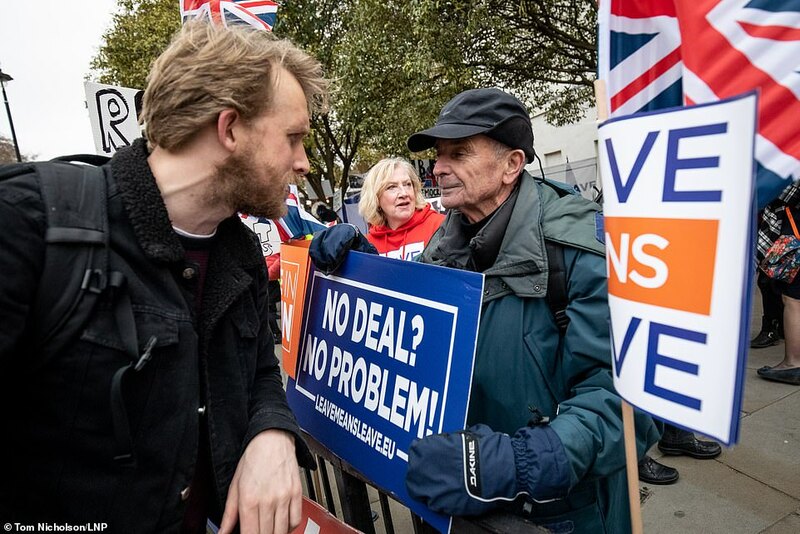 ‘I am talking to MPs who are on the fence, not sure which way to go – [to] give them support to reject the deal,’ explained Pete Bell, between shouts of ‘Stop Brexit’ through his megaphone. 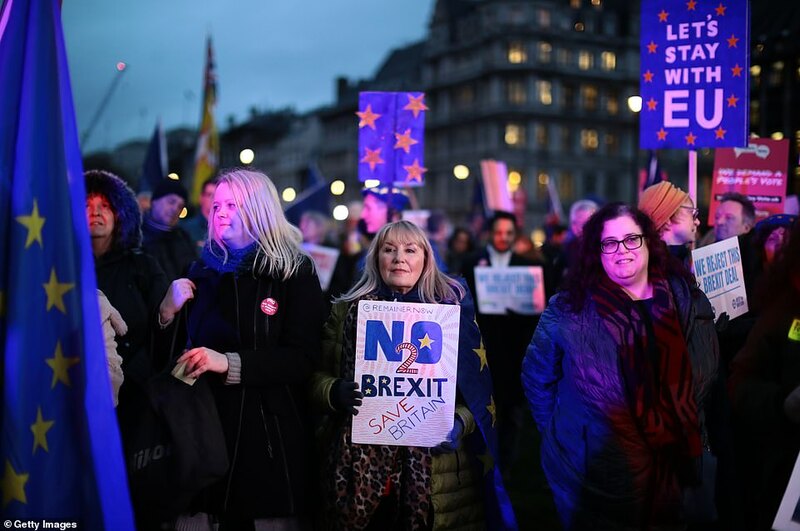 The NHS doctor believes that leaving the EU ‘will leave us economically in a bit of a disaster’ and is campaigning for a second referendum. 6.45pm: Theresa May will sum up the debate and make a final appeal to MPs to back the deal. 7pm: Voting will begin. First, MPs will vote on the amendments to the motion. Four have been selected by the Speaker. If any pass, the final vote on the deal is with the amendment attached. Each vote will take around 15-20 minutes, meaning the result should be in by around 8.30pm. 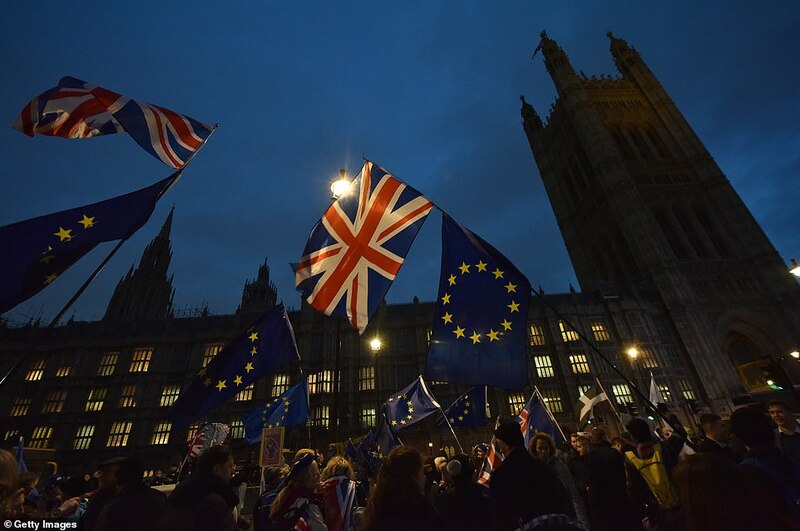 8.30pm: After the votes, Mrs May will make a statement setting out her response and the next steps the government will take. 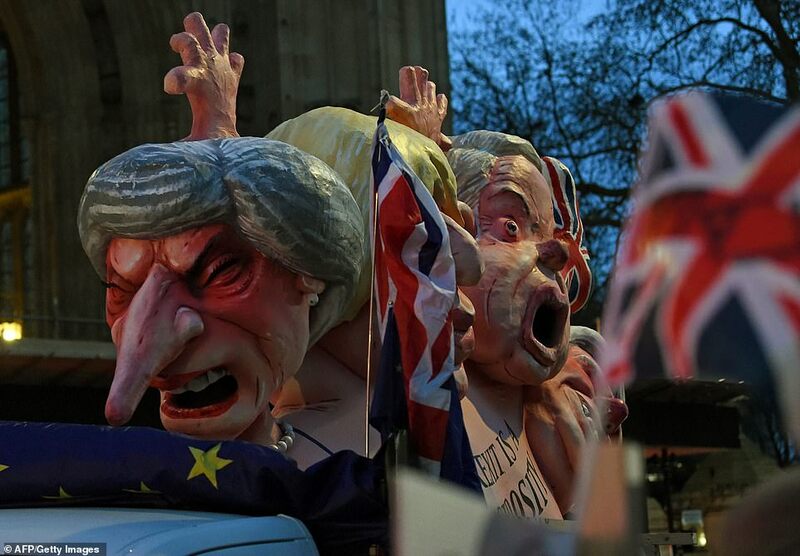 Mark Stevens also wants May’s deal to be defeated, but for very different reasons. 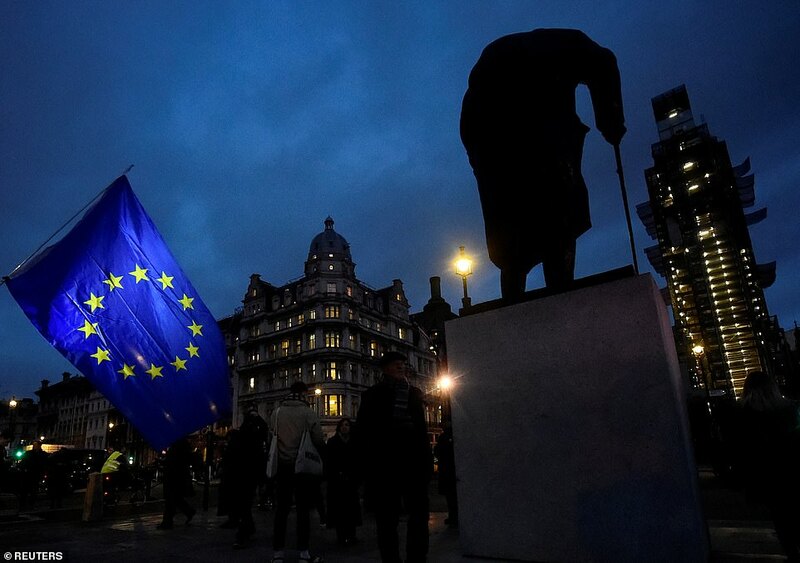 The ardent Brexit supporter hopes a damaging loss will lead to May – who backed Remain in 2016 – losing power. ‘At the moment we have very little enthusiasm and leadership shown for leaving,’ he said. ‘Someone who would have a more positive approach would help the thing work a lot better,’ he added. 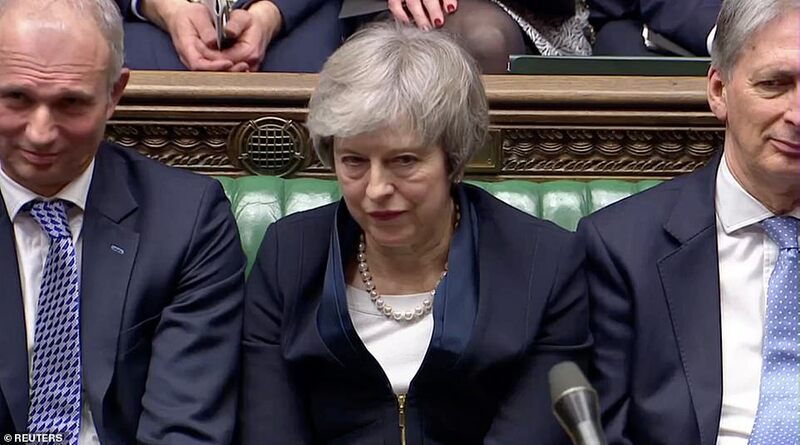 It came as Theresa May told her Cabinet yesterday that she won’t quit even if her Brexit deal falls to the biggest Commons defeat in history. 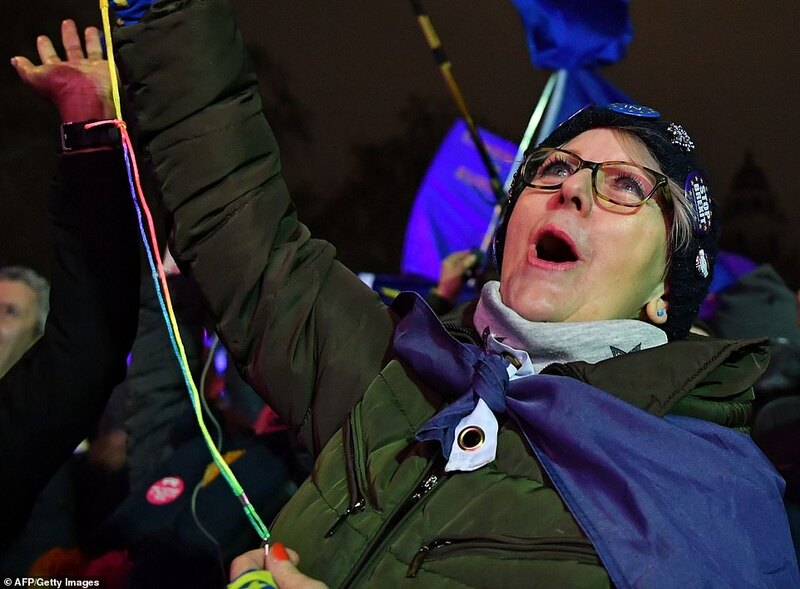 The PM signalled defiance as she gathered her team despite fears that she is on track for catastrophic failure in the showdown last night – with warnings the margin could be more than 200 votes. That would eclipse the record humiliation of 166 suffered by the minority Labour government in 1924. 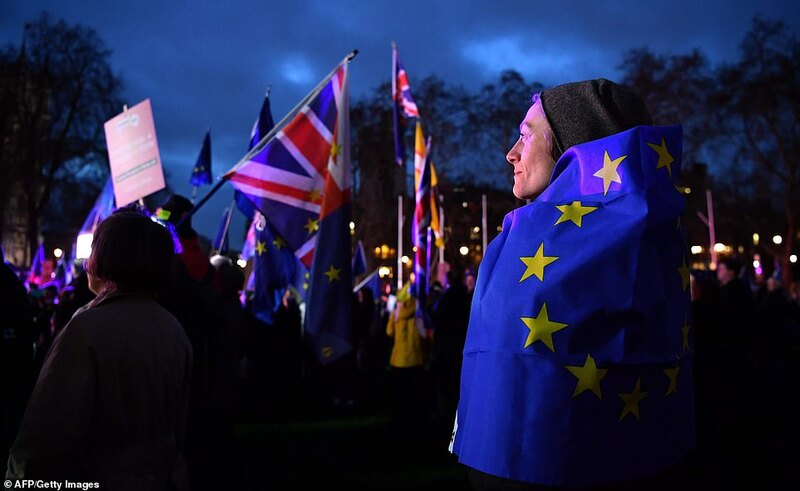 But Mrs May is said to have told Cabinet that she will not quit regardless of the scale of the loss, as her plan is the ‘only option’. 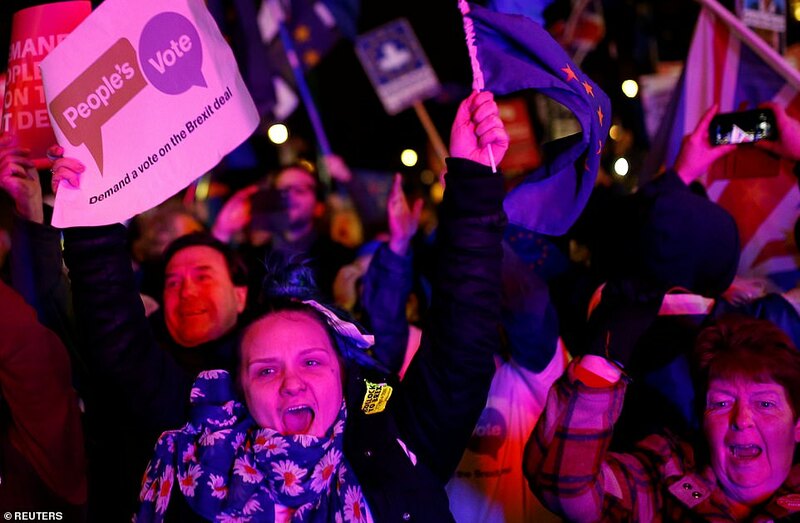 She said she was the ‘servant of the people’ and determined to implement the referendum result.